First, apologies for the long delay in getting a new post onto this site – this was due to both other commitments and a shortage of suitable, or, at least, sufficiently substantial, material. However, I was recently browsing the excellent Dutch maritime collections website, Maritiem Digitaal, looking primarily for suitable material for my new non-fiction book, Kings of the Sea: Charles II, James II and the Royal Navy. Having done so, I then entered a number of Welsh search terms, and came across some excellent links. During the Second World War, for example, units of the exiled Dutch Navy were based in both Holyhead and Milford Haven, and I referred to these sojourns in Britannia’s Dragon. A search of Maritiem Digitaal under the names of both those ports, as well as for related ones (such as ‘Pembroke’), turns up some fascinating supplementary information. ‘Holyhead’, for example, produces photographs of the Dutch warships Hydrograaf and Medusa alongside Pelham Quay in 1943, as well as a number of images, such as this one, of Dutch Marines training in the Anglesey countryside. There are also a number of photos, including this one, of the funeral at Holyhead in 1941 of M J R Matthias of HNLMS Noordsvarder, of the Stanley Sailors’ Hospital, and of the memorial in St Cybi’s church donated by the Protestant churches of the Netherlands, giving thanks for the area’s hospitality to the Dutch forces during the war. Perhaps we’ll forgive the captions that refer to ‘Holyhead, Engeland’! A search for ‘Milford’ brings up photos of the Dutch armed trawler Vikingbank in the Haven in 1942, the communications vessel Traversa, and the captain and crew of the minesweeping trawler Gerberdina Johanna in the Haven in 1941. Changing the search to ‘Pembroke’ brings up quite a number of photos of the Dutch forces celebrating Queen Wilhelmina’s birthday at the Pembroke Dock flying boat base in August 1940, such as this one and this one, as well as other photos of her son-in-law, Prince Bernhard, visiting the base. It’s worth trying several other Welsh search terms, too. Entering ‘Swansea’ brings up, among other things, a passport stamped both there and at Holyhead for Lubbert Kramer, boatswain of the tug Amsterdam, which escaped from the Den Helder naval base in May 1940; and two photos of the SS Texelstroom, sunk by a German mine in 1915 when en route from Amsterdam to Swansea (despite being neutral in that war). A search for ‘Cardiff’ reveals several photos, including this one, of Dutch Marines disembarking from HNLMS Poolster in Cardiff docks in 1967, in order to take part in joint exercises with the Royal Marines, as well as a large number of photos of the exercises themselves. Most surprising, perhaps, are a couple of fascinating oil paintings of Dutch naval personnel in Pwllheli during the period 1943-5. All in all, yet more proof that one can find important material for Wales’ naval and maritime history in all sorts of unlikely places! This entry was posted in Milford Haven, Pembroke Dock, Uncategorized, Welsh naval history and tagged Dutch navy, Holyhead, Koninklijk Marine, Milford Haven, Pembroke Dock on February 23, 2016 by J D Davies. A Nuclear Deterrent Submarine Base at Milford Haven: ‘Road Not Taken’ or Tabloid Fantasy? 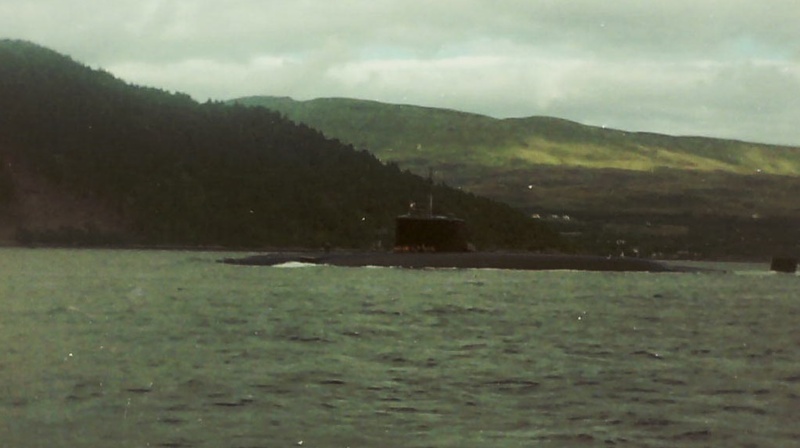 It was one of the sites considered in 1963-4, before the decision was taken to base the submarine deterrent force at Faslane. Indeed, a number of Welsh harbours – Carmarthen Bay, Tremadog Bay, Fishguard and Holyhead – made the original ‘long list’ of potential Polaris bases, but all were rejected at a very early stage because of unsuitable geography. Milford Haven made a ‘long short list’ of ten, with plans drawn up for a submarine base at Newton Noyes and a weapons facility at Angle, but it was excluded from the final short list of six on safety grounds due to the proximity of the then new oil refineries. Marginal/fair. The small village of Angle would lie within the area of major damage, in the event of [a] maximum credible explosives accident. Fire risk from large numbers of tankers present needs recognition. More prosaically, it was noted that shore side attractions were ‘limited’, and that the site possessed neither canteen nor playing fields, which would need to be built from scratch. 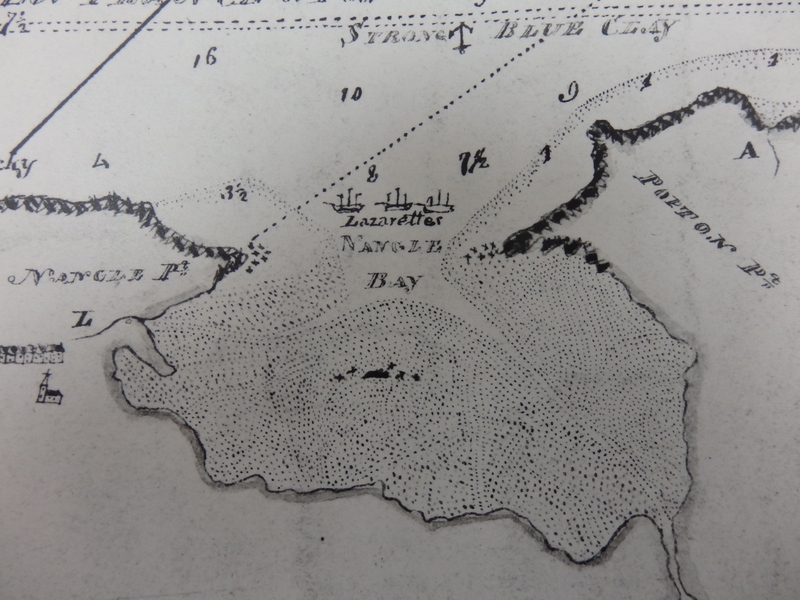 Requirements to establish the base included extended the existing pier at Newton Noyes by 100 yards and building a 200 yard pier at Angle for the new RNAD. It was noted that ‘opposition to acquisition or development from local and particularly industrial interests [was] likely to be strong’. It was estimated that it would cost £2 million to build the necessary new dock facilities, the same as at the other proposed sites; running costs were estimated at about £198,000 a year, roughly double those for Faslane but nearly identical to those at all the other proposed sites. Development of the Haven as a major oil port is far advanced and increasing. In deference to industrial interests, the Admiralty has agreed to reduce the handling and storage of mass-risk explosives in the area. The functions of the existing RNAD at Newton Noyes are being reduced accordingly. We see no other advantages at this site which would justify an attempt to reverse this policy…the safety distances which will be available when the Regent Refinery is built would be quite unsuitable. On political grounds also it is presumed to be inadvisable to put Polaris into this developing oil port. With the potential dangers of basing nuclear-armed submarines at Milford Haven now being significantly greater than they were fifty years ago, it might be interesting to witness the amount of political ‘spin’ and legerdemain that would be required to justify making such a move today, and to dismiss the entirely convincing arguments that were put forward when the matter was first aired. But these are strange and uncertain political times: and as a certain fictional Commander RN once said, ‘Never say never’! This entry was posted in Milford Haven, Welsh naval history and tagged Faslane, Polaris, Trident on February 2, 2015 by J D Davies. The anniversaries of the outbreak and early battles of World War I have led to a number of poignant commemorations throughout the length and breadth of the United Kingdom, including Wales. They have also led to a considerable amount of new research being undertaken on the lives of those who fought in and lived through the war, and on the war’s impact on local communities. But there are still many untold, or very sketchily told, stories of the last days of peace and first days of war, and one of those is the story of the brief period in 1913-14 when Milford Haven served as an operational base for several of the Royal Navy’s battleships. 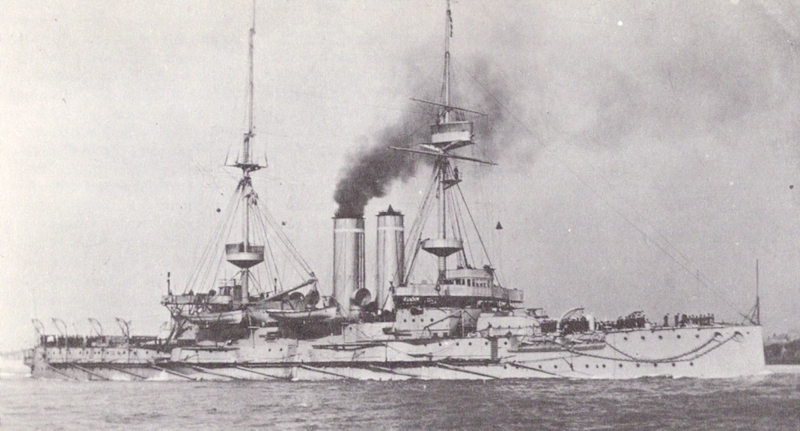 The decision to station warships at Milford followed the reorganisation of the navy in home waters in 1912, which saw the creation of First, Second and Third fleets. A number of old pre-Dreadnought battleships were allocated to the Third Fleet, and in 1913 several of these were deployed to Milford Haven as part of a plan to redistribute the ships in reserve. (It is possible that basing them in west Wales was at least partly intended as a response to potential future trouble in Ireland, where the Home Rule campaign, and Ulster’s opposition to it, were becoming increasingly problematic; however, this is speculation on my part, as I have found no firm evidence to support this contention.) The Goliath, which arrived on 30 April, became the senior ship, and by September the Third Fleet component at Milford comprised the battleships Goliath, Jupiter, Ocean, Canopus. and Albion, along with the large armoured cruiser Terrible, all moored at buoys in Scotch Bay. Life aboard must have been distinctly dull. 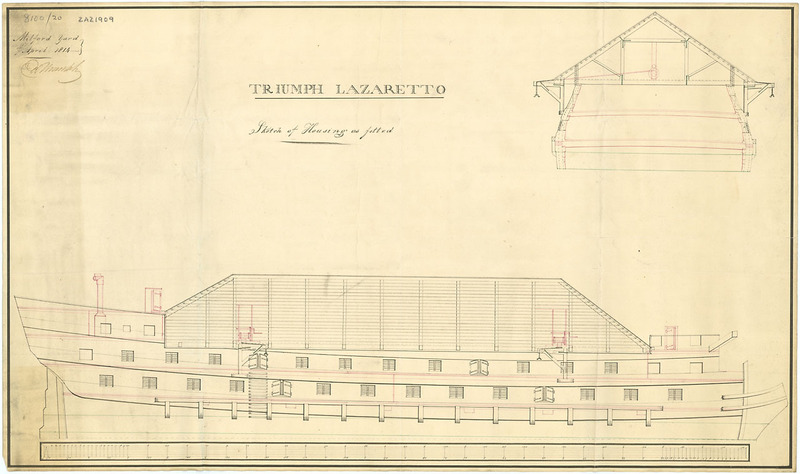 The surviving ships’ logs reveal an endless round of divisions, painting ship, PT drills, scrubbing the decks, making and mending clothes, and all the other humdrum activities of peacetime naval life, with boats ferrying men and stores back and forth between the ships and Milford, Neyland or Pembroke Dock. However, the skeleton crews of the ships (just over a hundred men on each of the battleships) swiftly entered into the life of the local area, and became important parts of the community. In August 1913 the ships entered crews in the Milford Haven regatta, held annually to commemorate Nelson’s visit to the town in 1802: Goliath won the whaler races for both seamen and Marines. The crews played football against local sides. In January 1914, for example, HMS Goliath‘s team, ‘the Gollies’, beat Narberth 4-1, while HMS Canopus drew 1-1 with Pembroke Dock St Patrick’s. The two teams played each other in March, but Canopus was hamstrung by being able to field only nine players, and the Gollies won 7-1. The men also contributed to the area in other ways: as one local newspaper put it in June 1914, ‘the presence of the officers and men has been welcomed from a business and social point of view, and everybody would be sorry now to part company with “Jack” who is now part of the life of the place’. 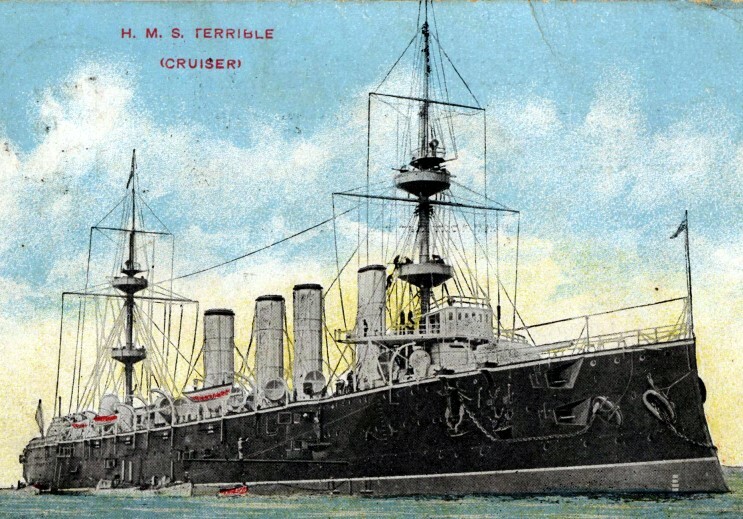 HMS Terrible: probably most famous for her part in the Boer War, when the heroics of her crew established the Royal Navy’s field gun races. At Milford Haven reservists began to arrive on Monday and were conveyed from Pembroke Dock to the battleships Goliath, Ocean and Albion so that on Tuesday, these ships which have been only manned by about 100 men each, have now a complement aggregating over 2000 men of all ranks. Rear Admiral Loftus Tottenham has hoisted his flag as senior admiral on the Albion, and Rear Admiral Phipps Hornby on the Ocean. On Tuesday the cruisers Gibraltar and Royal Arthur arrived and anchored off Newton Noyes pier, whilst two other cruisers went up to Pembroke Dock. These ships have crews of 100 men each, so that the entire fleet has nearly 1000 men aboard. 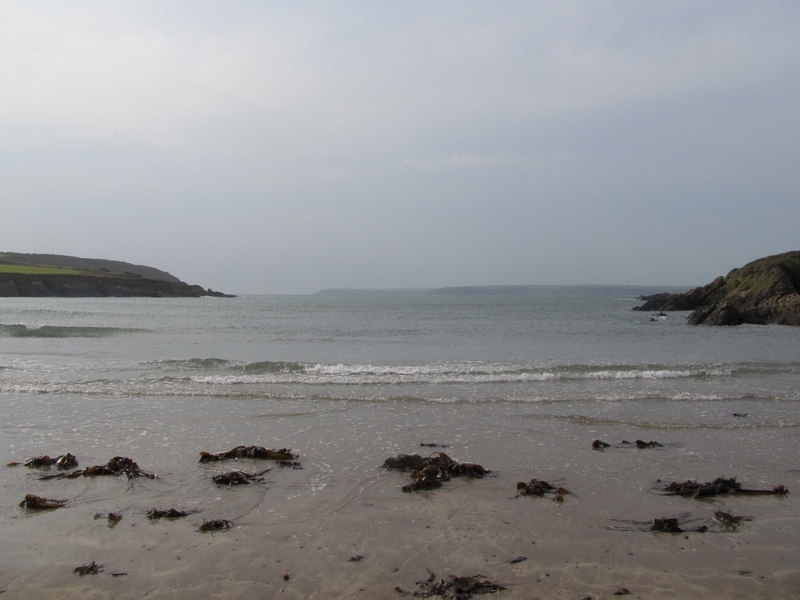 The fleet leaves Milford Haven tomorrow (Thursday) morning for Spithead, and will be absent until July 21 or 25. It is not definitely known if the Albion will return with the Goliath and Ocean, as she is due at Devonport on August 1st for refit. It is hoped, however, that the Canopus, which has been away under refit for three months, will come back to the base. Last week the three remaining vessels of the Third Fleet stationed at Miiford Haven, the Goliath, Albion and Vesper, left for the mobilisation at Spithead, and we understand that they will not return to Milford Haven. They are under orders to proceed to the Humber. where they will be stationed. Up to the present nothing is known of any vessel coming to Miiford Haven to replace them, and it appears that the idea of using the Haven as a naval base for large warships has been abandoned. 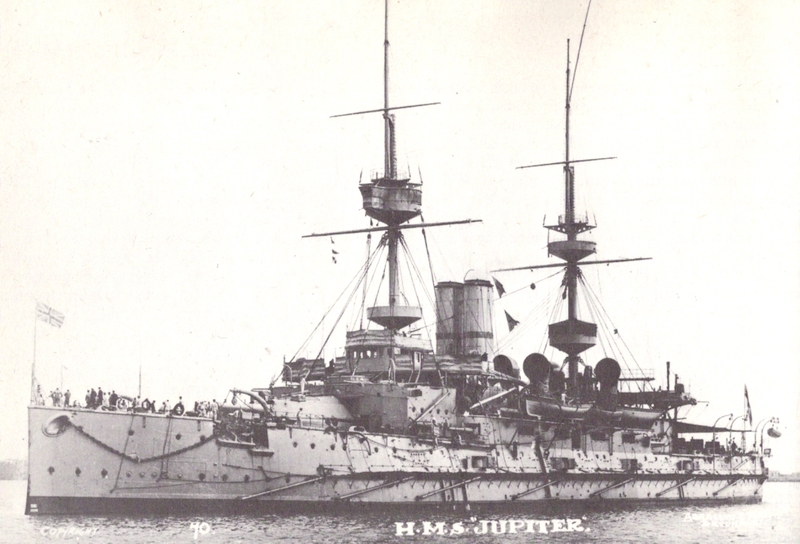 Some months ago, when first the Jupiter and the Canopus left, rumours went round that they would not come back, and when the Admiralty decided to sell the Terrible, there was considerable anxiety in Pembroke Dock and Milford Haven with regard to the matter. In the event, of course, all such speculation was swiftly rendered entirely academic by events. Less than a fortnight later, World War I broke out, and the ships that had lain in Milford Haven never returned to either there or the Humber. The Canopus was involved in the battles of Coronel and the Falkland Islands in November/December 1914, while both the Ocean and Goliath were sunk during the Gallipoli campaign. As I observed in Britannia’s Dragon, Goliath in particular had a relatively substantial Welsh component in her crew, and her strong connection with Milford Haven ensured that she and her men were deeply mourned in Wales. Milford Haven’s time as a fleet base was brief, but the presence in Welsh waters of a substantial part of the Third Fleet, and of some of the most poignant British naval losses of World War I, is an interesting episode in Welsh naval history which deserves to be better known. This entry was posted in Milford Haven, Uncategorized, Welsh naval history and tagged HMS Albion, HMS Canopus, HMS Goliath, HMS Jupiter, HMS Ocean, HMS Terrible, Third Fleet, World War I on December 15, 2014 by J D Davies. 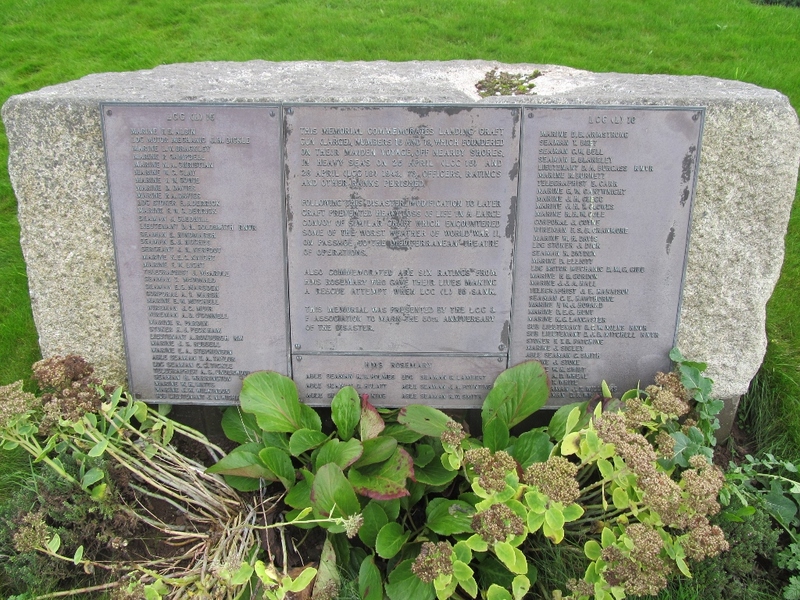 The memorial in Milford Haven cemetery to those who lost their lives aboard LCG(L) 15 and 16, swamped in heavy seas off Freshwater Bay during practice exercises for the invasion of occupied Europe; a detailed account of the disaster, and details of those named on the memorial, can be found here. This entry was posted in Milford Haven, Uncategorized and tagged Freshwater on October 29, 2013 by J D Davies. A port and shipping control exercise involving HMS Mersey and significant numbers of reservists is taking place in Milford Haven – full story here. This harks back to the harbour’s late nineteenth century heyday as a base for major naval manoeuvres; see this previous post. This entry was posted in Milford Haven, Uncategorized on September 19, 2013 by J D Davies.